My six year old son Rudy came home last night with a letter he had written at school that I had to sign. I didn’t know what he was talking about until he broke (it didn’t take much persuasion), confessing that he had been naughty in class and his teacher had made him write a letter as his punishment. I read the letter, the gist of which was that he had put pen on his friend Roman’s ‘teeshert’ and that he was sorry. 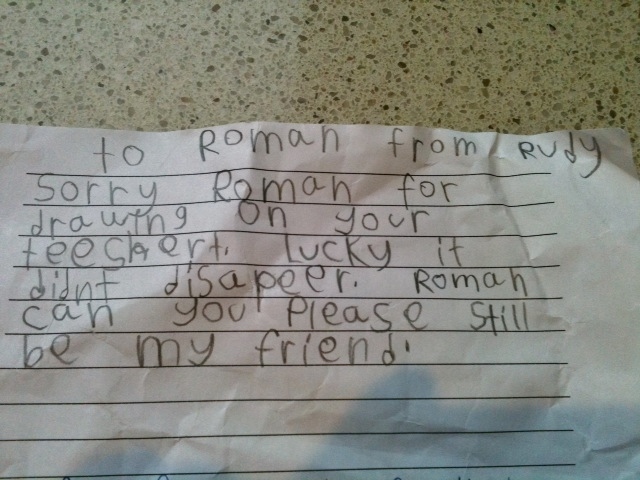 The letter ended with, ‘Roman can you please still be my friend.’ In the words of Natalie Imbruglia, I was torn. Should I tell him off or should I cuddle him for being so lovely? I opted for a soft telling off (‘But Mummy my brain just went haywire,’ he replied) and wrote on the letter that if Roman needed the garment washed or replaced, he should let me know and I would sort it. I escorted one contrite six year old and the letter to class today and spoke with Miss Amy. She told me about how upset Rudy was after the incident adding, ‘He did all the right things to make amends.’ I whispered to my son, ‘She’s a bit scary.’ We both smiled and off I went to get on with my day. I honestly don’t know how I feel about the punishment letter. It probably worked and it’s probably ‘right on’ to say that my child has learnt a valuable lesson, but something just doesn’t feel right about it. Before school that morning, my three were running around at home like complete lunatics, the dog and cat were fighting and I was listening to The Phantom of the Opera at full blast pretending to sing like Sarah Brightman (bugger me, there are some high notes). Yes, this is a typical morning in our house. The kids thought my singing was terrible (honestly, there’s a lot of fuss about how technically difficult it is to sing opera; I reckon it’s quite easy), my other half came at me with a large blunt object and my daughter turned off the music which to her was very amusing. I went in the shower for my two minutes of peace (now that is hilarious), only to have two faces appear at the shower door. Rudy was upset that his older sister had shut his arm in her door (she’s going through a phase where no boys are allowed in her room). When I chastised her, I got this response, ‘Mum, you would not believe what Rudy did: he drew on my bedroom door and then rubbed his bare bottom all over it.’ Now come on, honestly people, what would you have done? I did what any disciplinarian mum would do and fell about laughing. Why am I telling you all this? Well, put simply I’m in a dilemma. I want my kids to be responsible, caring, loving people who put themselves out for others and who are liked by everyone they meet. I want them to be well-adjusted, well-mannered and well-meaning. How can I pass on these virtues when I myself am a little toe-rag? A case in point: three weeks ago I was out with the girls (three middle-aged married women with kids) and we were absolutely steaming drunk. We ended up at the local pool hall – I know, really weird, but Deb needed a wee – and, after playing a few games, we were asked to leave by the management. I was sprawled all over a pool table with my legs in the air, whilst one of my companions was beating me (quite hard I might add) with a pool cue. A big moustachioed chap came over and shouted, ‘That’s enough now laydeeze; you’re out!’ As you can imagine this was the funniest thing that had ever happened to the four of us in our lives, and we laughed like menopausal hyenas as we made our way out of the bar. I didn’t share the anecdote the next morning with my three children. Actually I don’t think I spoke for three days because of the alcohol poisoning. But do you see why I am in a moral conundrum? At the age of forty three, being naughty and doing daft things is just who I am. I can’t tell you most of the tales from big nights out because my mum reads this blog, so does my partner and one day my kids might too. Will I ever be responsible, grow up and stop acting like a teenage boy on speed? Probably not, but if we do happen to end up out for a few pints one night, just remember: mum’s the word! 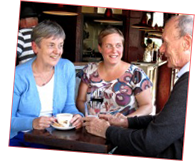 Wouldn’t worry too much Emily – I’m nearly seventy and still don’t know what I want to be when I grow up. And that is why Mr Hoffman, we must go out for a drink or two the next time you come over! Quite right, you always were a little (being the operative word) toe rag. Why do I always have to be dragged into these discussions. I don’t even know you . . . Who are you?